Innovative Labs WICKED Pre Workout: Lives up to its name! On training days: take 1 heaping scoop to access personal tolerance. Once tolerance has been assessed, users may increase dosage to 2 scoops in 6-8oz (depending on taste preference) of ice cold water. Do not take with food. On non-training days: Take 1 scoop in the morning to help maintain increased nitric oxide, ATP and energy levels while assist in reducing body fat and fatigue. Not for individuals under the age of 18 years. Do not use if you are pregnant or nursing. Consult a physician prior to use if you have or are at risk for prostate, hypertension, liver diabetes, heart disease, or any other general medical condition. DO NOT use this product if you are taking MAOIs. Consult with your physician prior to use if you are taking other medications. This product can raise blood pressure and interfere with other drugs you may be taking. Talk to your doctor about this product. Discontinue use immediately if you experience rapid heartbeat, dizziness, vomiting, or other similar symptoms. KEEP OUT OF REACH OF CHILDREN. Maltodextrin, natural and artificial flavors, citric acid, malic acid, sucralose, FD&C red #40. Jan 20, 2016 Innovative Labs Wicked Pre Workout: 70mg DMAA!! The limit-pushing ingenuity behind Innovative Laboratories bodybuilding products are now wreaking havoc on the pre-workout market with the unleashing of their latest legacy: Innovative Labs WICKED (click the link to read about the ingredients in the blog). Due to the sheer energy of this pre workout, it's been named one of our favorite pre workouts for energy! This merciless MASS-MAKER employs a triad matrix of one-of-a-kind clinically engineered Nitric Oxide Amplifers, Cell Volumizers & Neurogenic Energizers for pro-anabolic supremacy. WICKED is not just another me-too pre-workout product as it is truly a state-of-the-science product with several components found only in WICKED such as: Agmatine silicate; L-Citrulline Silicate and Red Wine 30% extract! WICKED is an elite preworkout stack that provides explosive energy, long-lasting endurance, increased strength and power, road-map vascularity, and razor-sharp mental focus WICKED will help you to have the best workouts of your life! You will defy limitations with each and every workout being your best! WICKED is simply that....a WICKED preworkout putting your body in "beast mode" and causes you to have wicked energy, skin tearing pumps and freaky vascularity, all while increasing strength, giving you more endurance and keeping you focused throughout the entire workout and wishing you did not have to end the training day. 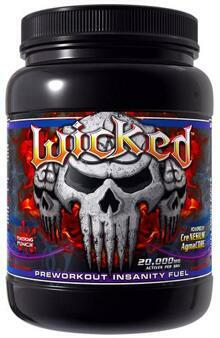 Once you have used WICKED it will be preworkout supplement that you will never want to train without. WICKED guarantees to give you what you need without pixie-dusting ingredients or giving you nothing more than excessive caffeine.